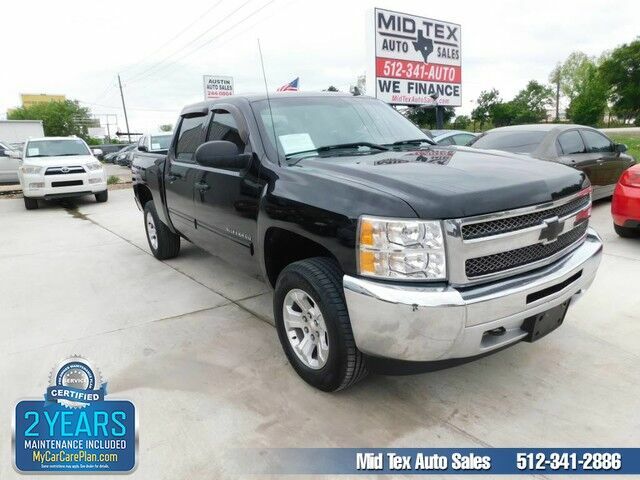 Mid Tex Auto Sales is excited to offer this 2012 Chevrolet Silverado 1500. This 2012 Chevrolet Silverado 1500 comes with a CARFAX Buyback Guarantee, which means you can buy with certainty. Simply put, this Four Wheel Drive is engineered with higher standards. Enjoy improved steering, superior acceleration, and increased stability and safety while driving this 4WD Chevrolet Silverado 1500 LT. Look no further, you have found exactly what you've been looking for. More information about the 2012 Chevrolet Silverado 1500: Full-size trucks are used in such a wide range of situations--from construction fleets to long-distance driving--and the two different interiors offered in the Silverado and the nearly identical GMC Sierra help satisfy shoppers better than most other competing models. LS and LT models are probably the best fit for buyers who need the sturdy, get-messy capability of a pickup at least some of the time, but the LTZ is the choice for those who need a pickup that doesn't compromise luxury. And for those who need a pickup but want to make a greener choice, with even lower operating costs, the Silverado Hybrid has 25% better fuel economy without sacrificing much towing or hauling ability. This model sets itself apart with fuel economy, extensive features and options, Top-notch interiors to suit work or luxury use, and strong tow ratings Visit Mid Tex Auto Sales online at www.midtexautosales.com to see more pictures of this vehicle or call us at 512-341-2886 today to schedule your test drive.